The JAX-9B weather facsimile receiver is a very compact and lightweight solution, incorporating a set of enhanced features that allows for flexible operation. 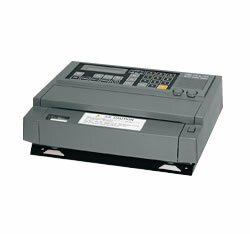 The received fax broadcasts are recorded on thermal recording paper, using a thermal head with less moving parts. JRC integrated an automatic frequency selection, allowing for optimised receiving. The JAX-9B can receive in four different modes. All operations can be remotely controlled to automatically start up, set parameters, receiving images, feed paper, and stop by remote signals from the broadcasting stations. Only halftone recording is manually controlled. You can manually set the index of co-operation (IOC), scanning speed, and the halftone recording. The JAX-9B automatically records and stops in this mode. This is an extensive function of the automatic recording mode. The JAX-9B can manually record while neither in automatic or manual recording mode, also while broadcasting is in progress. Phasing is done manually. It also adopts to an unique system to terminate phase matching instantaneously. The period of the start and stop modes, station frequencies, and half-tone on/off are easy programmable. Whilst combined with the fully automatic mode, and unattended, error-free operation is made possible. The built-in synthesised receiver is capable of setting any receiving frequency from the ten-key pad, and is able to preset up to 90 spot frequencies in the memory. This feature is very effective when receiving any new broadcast frequency and changing the station frequency. Pictures of clouds can be recorded in 16 gradation levels. This digital method ensures high resolution recording, using a proprietary system that finely reproduces maps and latitude and longitude grids with very fine and accurate lines. Up to 90 channels of memory frequencies and up to 15 channels of programme lists can be printed out on the recording paper. This function is especially useful for setting programming and checking the stored frequencies. All received faxes can be displayed on your own PC, allowing you to view (and save) the image before seeing the actual recorded image. This function allows you to quickly view the image digitally, which greatly facilitates the need for immediate decisions. On top, the JAX-9B can also be configured for remote maintenance. JRC has developed a unique function that is capable for remotely monitoring and analysing for any faults that may occur in the system, allowing for prompt action and service. The JAX-9B weather fax is remarkably compact and lightweight, allowing for a more flexible installation approach in confined spaces.